What Do You Look for in a Cholesterol Report? Regular readers know that I am a senior citizen and work at keeping up on my health. I get blood work done at least once a year and sometimes more often. This week was one of those times, so I thought it might help you to understand your cholesterol number more if I went over mine. Here are my numbers from Tuesday. As you can see from the standard ranges offered, I am on the high side for total cholesterol, but the main reason is that my HDL cholesterol – the good cholesterol – is so high. 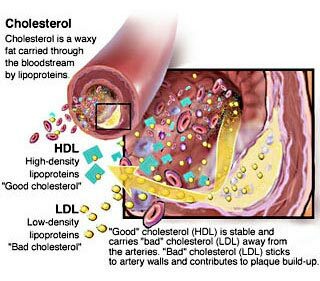 The non-HDL cholesterol number is simply the total cholesterol minus the HDL measurement. It is more relevant in patients with high triglycerides. Regular readers know that I am a regular bike rider, averaging over 20 miles a day year ’round here in Chicago. Last year I pedalled 8433 miles. In addition to my regular exercise, I also pretty much focus on a Mediterranean Diet. You can type that subject into the search box at the right to read lots more on the value of Mediterrarean eating. Lastly, I would like to add that several months ago I got very interested in coconut oil and have included at least three tablespoons of the oil into my diet daily since then. You can read Why should I try coconut oil? from April. Clearly, this saturated fat has much to recommend it in view of my cholesterol numbers.